ITEM FUNCTIONALITY: Device is fully tested and in 100% working order. Reset to factory original settings. The device is unlocked to all carriers. COSMETIC CONDITION: ---Excellent cosmetic condition. Some very little signs of use such as small scratches, small nicks. ITEMS INCLUDED: It will not have a sim card, headphones or the original box It will not have a generic charger. Internal Carrier: Verizon. BLACK Tablet. NO BOX. ASUS Google Nexus 7 32GB Wifi Tablet. With over 8 hours of HD video playback, 10 hours of web browsing, and 10 hours of e-reading, Nexus 7 is designed to go the distance. 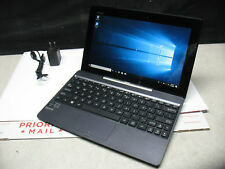 ASUS Z10 ZenPad 32GB Verizon Tablet. Multitasking is quick and smooth with the Hexa-Core processor. 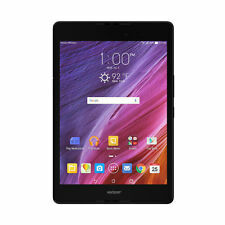 ASUS Z10 ZenPad Verizon Tablet. Even with its huge, wide-angle display, ASUS ZenPad Z10 is astonishingly slim. ASUS Z8 ZenPad Verizon Tablet. Features : Looking for a tablet that really draws you into the action?. One with a picture so sharp and sound so dynamic that it transports you right into the stadium or concert hall?. This tablet is in very good working condition with normal wear/scuffs. Wall adapter not included. ASUS ZenPad Z8S P00J 16GB Wi-Fi 4G (Verizon Unlocked) 7.9in Gray Tablet. 16GB eMMC 1. ASUS Tru2Life Technology. Tablet: Android™ 7.0. Verizon or Any GSM Provider. 1 x Micro SD Card Reader, up to 128GB SDXC. 2GB of RAM & 32GB of Onboard Storage. 2K 2048 x 1536 Native Resolution. Up to 8 Hours of Battery Life. 802.11b/g/n Wi-Fi Bluetooth 4.0. The item may be a factory second or a new, unused item no with defects. Device is in VERY GOOD used cosmetic condition with normal wear. Device is in 100% WORKING condition. It has been extensively tested and found to be fully functional. 16GB. Tested and works great! Comes with generic sync cable. Nothing else. Shows normal signs of wear. EXCELLENT CONDITION - Grades out to a 9 out of a 10, just has a few minor marks on screen. Tablet is in great condition. Has been in a case since I bought it. It also has a glass screen protector on it as well. Condition is Used. The tablet does have the office key which I have never used or installed. The wacom stylus does not currently work. This could just be a driver issue, I've had windows drivers cause issues in the past, I don't know if that is currently the case. Warranty does not apply for 'change of mind, compatibility issues, or other similar reason. Condition is Used. Working tablet. Reset to factory. The tablet itself. A Leather like carrying case with a flip over cover. There is minimal wear on the body from normal use, surface scratches on screen and nics on body, as shown in pictures. It does not affect the functional integrity of the tablet whatsoever. If you would write ‘Recycle” on the outside of the box and send it back we will make sure your item gets processed through the proper local downstream when it arrives! Nexus 7 (1st Generation) 16GB, Wi-Fi, 7in, Black, New In Box. Condition is New. Shipped with UPS Ground. Has Cherry Trail Quad-Core Z8500 Processor and Windows 10. Nexus 7 (1st Generation) 32GB Wi-Fi 7in - Black. Condition is Used. Tablet is still in great condition. Has been reset to factory settings. Comes with purple case pictured and charging cable. Feel free to contact with any questions. THIS TABLET CAN BE USED WITH REGULAR WIFI. This Tablet is for AT&T. IT CAN ALSO BE USED (YOU MUST HAVE A SIM CARD) WITH. Sim card Not Included. (we are usually very quick). ASUS Tru2Life Technology. Includes 64gb extra storage SD card. Silver, Gray. Wireless Data Network. G-Sensor/ E-compass / Gyroscope / Light / Hall Sensor /fingerprint sensor/ Sensor Hub. 1 × Micro SD Card Reader, up to 128GB (SDXC). Make: Asus. Check with the manufacturer for more warranty information. Most devices have rub marks on rear cover, and possible marks/dings from mounting stand. These tablets are compatible with GSM carriers. We are able to provide a link to the AT&T Device Unlock page, if necessary. New ListingNexus 7 (2nd Generation) 32GB Wi-Fi 7in - Black - EXCELLENT CONDITION! Slim new design increases comfort and portability, narrow bezels make it easy to hold in one hand. Resolution 1200 x 1920 pixels, 16:10 ratio (~323 ppi density). Status Discontinued. Now you have all the stuff you need, when you need it. 4.5 out of 5 stars - Nexus 7 (2nd Generation) 32GB Wi-Fi 7in - Black - EXCELLENT CONDITION! 284 product ratings284 product ratings - Nexus 7 (2nd Generation) 32GB Wi-Fi 7in - Black - EXCELLENT CONDITION! 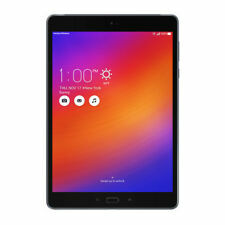 The Asus ZenPad Z8 is a single SIM (GSM) that accepts a Nano-SIM card. Asus ZenPad Z8 was launched in June 2016. Asus Zenpad Z8 WIFI ONLY Black 16gb. Network :WIFI Only. This is necessary to keep your right to file a claim. Google Nexus 7 (2nd Gen) 16GB. Wi-Fi 7" Android Tablet. Nexus 7 (1st Generation) 16GB, Wi-Fi, 7in - Black. Condition is Used. Shipped with USPS Priority Mail. This nice tablet has been kept in a protective case and also a protective screen cover so there are no scratches (Only on the protective screen/cover and not the device’s screen). I’m including a keyboard with the item and also the charger. ASUS Nexus 7 Tablet 16GB, Wi-Fi, 7in, Black, Bundled W/ Charger & USB Cable! Each one has been factory reset. 4 out of 5 stars - ASUS Nexus 7 Tablet 16GB, Wi-Fi, 7in, Black, Bundled W/ Charger & USB Cable! 45 product ratings45 product ratings - ASUS Nexus 7 Tablet 16GB, Wi-Fi, 7in, Black, Bundled W/ Charger & USB Cable! Asus Google NEXUS 7 1st Gen Wi-Fi Only Black And Not Sure 8 GB, 16 GB Or 32 GB. Fast and accurate fingerprint sensor is the perfect blend of strong security and incredible convenience. Android 6.0 OS. Interfaces: 2-in-1 Audio Jack (Headphone / Mic-in), Micro SD (SDXC)/ Max.128GB, Type C.Display: 400 nits. Used Google/Samsung Nexus 10. Running the most recent Android available for this device, 5.1.1. Works great. See pictures of actual tablet. Typical minor scratches and scuffs. Trending at $82.49eBay determines this price through a machine learned model of the product's sale prices within the last 90 days. Asus manufactures a variety of tablets and eBook readers. While some offer keyboards, there are touchscreen-only options as well. The products feature a clear display with a large number of pixels. What can you do with the eBook readers? In addition to reading eBooks, these Android devices can also access Google and perform Google searches. In fact, they can do most of the same things that other electronics do. It's possible to use Bluetooth with many of them. How do you reset an Asus Tablet 7 inch? Turn off the power with the power button. Press the volume up button along with the power button. Hold them for around two seconds. Let the buttons go when boot mode appears. Choose recovery from the menu screen. Do this by scrolling with volume up. Then, confirm with volume down. Push volume down to choose wipe data/factory reset. Push volume up on the Android device to confirm it. After this, select "yes" when you're asked whether you want to delete all user data on the Android device. Then, restart the tablet by selecting "reboot system now" to complete the process of resetting. How many gigabytes do Asus eBook readers and tablets hold? The specific number of gigabytes in Asus tablets varies between the Asus products. While some of the tablets hold 16GB of random access memory or RAM, other Asus handheld products hold as much as 64GB of RAM. The memory on the hard drive is much higher on many products such as the Nexus 7. What is the processing speed of these products? The processing speed of the tablets and eBook readers varies considerably. Some have around a 1.2GHz processor speed, and some of them are quad-core. Others feature processing speeds of over 1.3GHz. Some of them have an Intel processor such as the Nexus 7. Intel processors run at high speeds. What operating system do these products use? These Asus products usually use either Android or Windows. A few use other operating systems such as some models of the Nexus 7. Some of the products use the Google Chrome system, like the Google Nexus 7. What types of tablets and eBook readers are there? Content provided for informational purposes only. eBay is not affiliated with or endorsed by Asus.